4. Remove the vegetables from the oven and put the pepper pieces into a small plastic bag and close the bag. After about 20 minutes, you will be able to easily peel the skin off the peppers. 5. 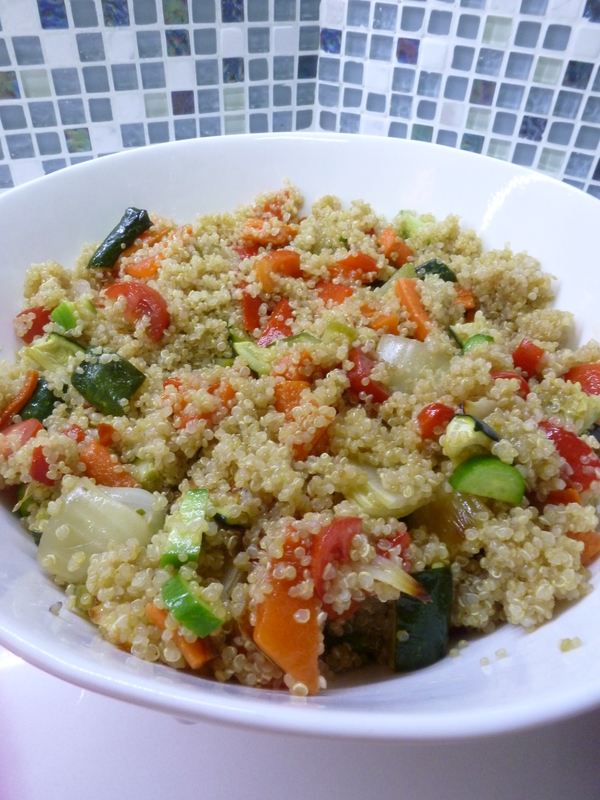 Chop up all the roasted and vegetables into small bite-sized pieces (discarding any papery, dark onion slices); and add to the quinoa, along with the chopped fresh vegetables. 6. Mix the dressing in a jar with a lid that closes well by adding all dressing ingredients plus the roasted garlic, which you squeeze out of the top part of the head. If you find this difficult, take a serrated knife and slice the tips of the garlic cloves off and then squeeze – it’s just like squeezing toothpaste. Shake the dressing very well and taste for flavor. Pour over the salad and serve. Made this yesterday and it was FABULOUS!! Decided to leave out the cukes and add a big, hard beet (I LOVE roasted beet) which gave the whole dish a beautiful deep, red color. This dressing is amazing and a perfect compliment to the vegs and quinoa. You did it again Margo – Thanks!!! Thanks Heidi. I love the idea of the beets. What’s fun about this recipe is that you can add any veggies you like.